Premièring in 1979, Thomas Babe's Taken in Marriage is a bit of an odd duck. Primarily famous for a performance by Meryl Streep in the original off-Broadway production, it's since sunk into obscurity. I can see why. Set in the basement of a New Hampshire church, the women of a rich New York family have gathered for a wedding. They are: Annie (Alex Critoph), the bride-to-be; her older sister Andy (Liane Grant); her mother Ruth (Jeryl Burgess); and her spinster aunt Helen (Joan Plunkett). All four have different perspectives on marriage; ranging from Ruth's strict loyalty to the vows, to the serial bride Andy, now on her fifth husband. As you can reasonably predict, this is going to be the theatre of dramatic revelations, copious tears, bitter recriminations and lots of hugging. The catalyst for all this is Dixie, a good ol' working class country singer in tight jeans whose earthy, honest femininity gradually scours away the secrets and lies plaguing the family. On paper this all sounds promising: these women are all fine actors, and there's even a couple of LAMDA alumni thrown into the mix (always a good sign of quality). Each of them approaches their role sensitively, understanding and accentuating their personalities and histories throughout the performance. Each woman gets a moment in the spotlight; usually a mini-monologue about their marital woes. In isolation they'd be nice showcases of talent, with the highlight Jbeing oan Plunkett's touching confession on lost love. Problem is, Taken in Marriage is, well... Let's not mince words; it's boring. For vast swathes of the first act nothing of note is happening. That isn't a death knell for excitement, the absence of propulsive narrative can usually be made up for by interesting character moments or humour, but even those are few and far between. Contributing to this staidness is a weird lack of tension - though presumably there's guests gathering upstairs as wedding preparations swings into gear - but no-one seems overly stressed or busy. This lack of pre-wedding hum suggests that whatever happens is a foregone conclusion i.e. not exactly storytelling dynamite. Hardly helping matters is the flat lighting and dowdy set design. Granted, the action is set in the ratty basement of a church and this is naturalistic drama, so flights of theatrical flair aren't on the cards. However, plays set in single locations provide opportunities for intricate, detail-orientated realistic set design. There's elements of this; the noticeboard on the rear wall is covered in church literature for example, but by and large stagecraft consists of a couple of tables, chairs and paper bunting thrown over a plain black stage. The upshot of all that is when the juicy accusations finally begin flying the audience is mentally checked out. I confess I was struggling to stay awake for the latter half of the first act, having to make an emergency interval trip for a can of energy drink to see the thing through. As the second act started there was the telltale aroma of coffee in the air, hinting that I wasn't alone in needing a jolt of caffeine to power on. 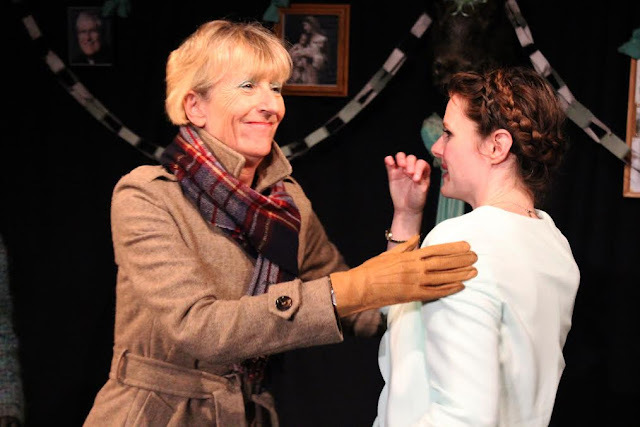 There are many flaws a play can overcome; iffy production values can be saved by a bold performance; you can paper over underdeveloped characters with smart costuming and so on and so forth. But for this production a deeply dull text is too high a hurdle to clear, even for a cast with obvious talents. 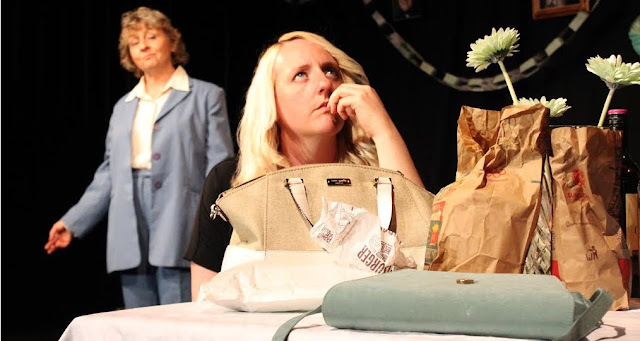 Taken in Marriage is at the Waterloo East Theatre until 18 July. Tickets here.